To change the windows 8 / 10 or 8.1 local date and time, please start/open the date and time properties window. 1.) ... Changing the date and time classic solution! 2.) ... Other ways to change the date and time! 3.) ... Change the Windows time and date format! 4.) ... Open date-time properties via desktop clicks! Hot-Tip: ... Corrections and manipulations of the file times, or folder times! 1.) Changing the date and time classic solution! 2. Then just type the command control.exe date/time. 4b. and/or calendar settings [... see Image 1]. (Image-1) Change the windows 8.1 and W10 Local Date and Time. 2.) Other ways to change the date and time! If you are not completely satisfied with the upper solution, changing the date and time, you can also use a more professional solution to change the date and time on the Windows PC. And by the way, it is possible to stand out with its special expertise, although it is a rather old but elegant option to change the date and time. 3.) Change the Windows time and date format! 1. 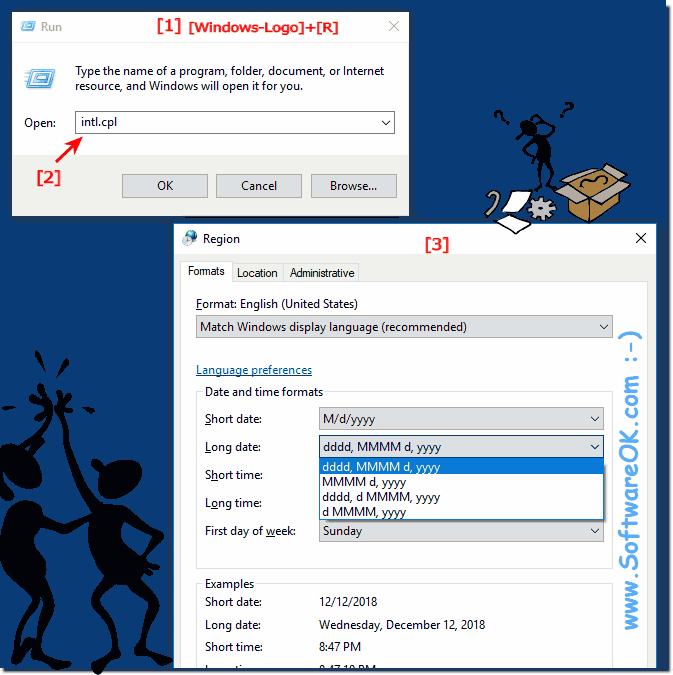 Open the window "Region - Customize the format" in Windows 10 / 8.1 / 8. 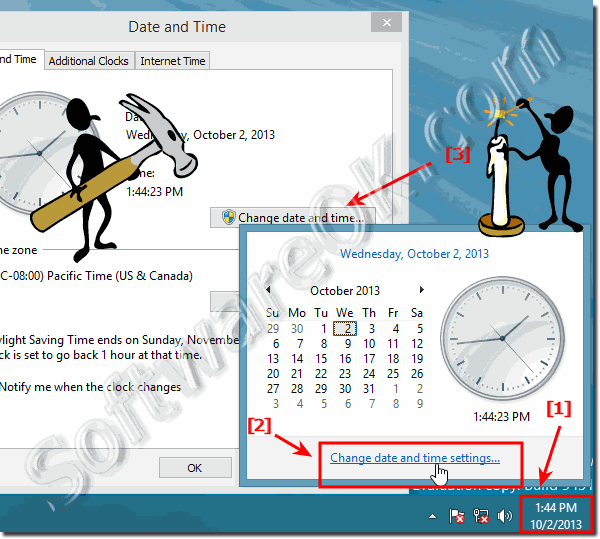 (Image-2) Change the windows date and time format! If you would like to change the time and date yourself under the Microsoft Windows operating system, you can quickly do this via the Date and Time dialog. Here is also an example of how to quickly set or change the date and time format if it is displayed incorrectly, which also affects other desktop clock programs! 4.) To open date-time properties via desktop clicks! 4a.) ... Date-time properties Window 8.1 / 8! 4b.) ... Date-time properties Window 10! 4a.) Date-time properties Window 8.1 / 8! Use left-mouse click on the Windows-8.1 / 8 Desktop-Clock and click "Change date and time settings..."
text and "Change date time ..." button! 4b.) Date-time properties Window 10! In Windows 10 do a left click on right area of the Task bar and change date and time! 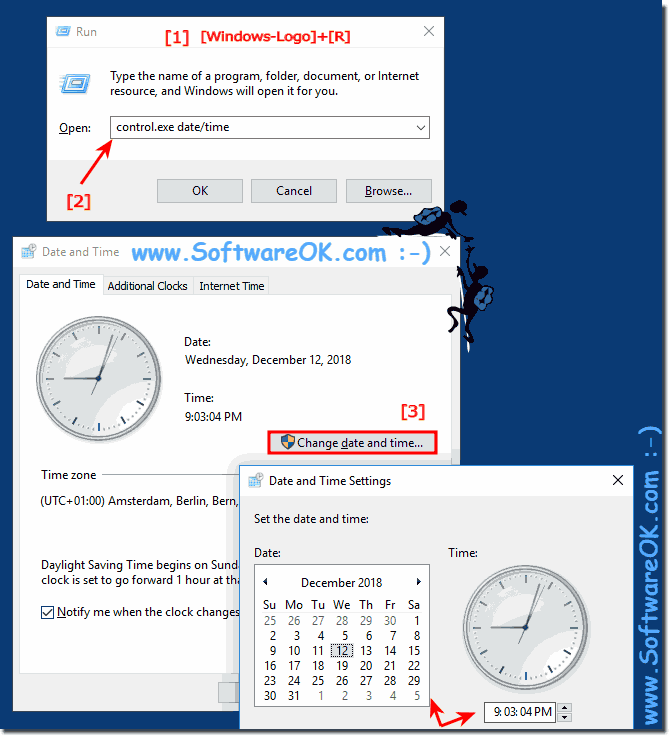 (Image-4) Change the Windows 10 local date and time! As you can see above in Windows 10 and 8.1 shot screenshot, it is easy to change date or time in Windows or to adjust the format. As a solution to change the date and time, you can easily apply this example to earlier versions of Microsoft's Windows operating systems. It is always possible to change the date and time whether it is a Windows desktop computer or a Windows Mobile Tablet, Surface Pro / Go, or even a Business Server operating system, it has been tested and successfully verified. Windows-8 - FAQ-76: How to change the windows 8.1 and 10 local date and time?